Silversea Cruises has announced that 10 voyages this year will feature the Relais & Châteaux L'école des Chefs interactive cooking school. 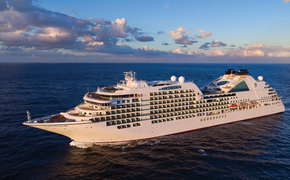 Through this partnership, Silversea will offer the only Relais & Châteaux L'école des Chefs cooking school at sea. The program offers guests a culinary curriculum and events hosted by Silversea culinary trainer Chef David Bilsland. The curriculum for each of these cruises is designed to celebrate the cultural flavor of the ship's itinerary. Workshops cover a range of topics, including basic knife skills, kitchen terminology, sauces, baking, cooking demonstrations with wine pairings, interactive Q&A sessions, cooking competitions between Bilsland and the ship's culinary team, a Lunch and Learn event, and Take It Home recipes. Also offered on certain voyages, when the itinerary permits, is a Market to the Plate program, which includes an escorted tour of a local market, followed by a cooking class and a Culinary Outing to a local restaurant, hotel or other venue. The cooking school voyages cover several destinations, including Africa, Arabia and the Indian Ocean; the Caribbean, Panama Canal and Mexico; the Far East and South Pacific; the Mediterranean; and transoceanic cruises. Fares range from $5,198 to $17,638 per person, double, depending on the itinerary. For more information, call 877-215-9986 or visit www.silversea.com.